Removing the wall mirrors in my dining room left me with a couple dozen spots of black, rock hard construction adhesive and (surprise!) flocked wallpaper. Removing the gunk and making the wall look like the others was pretty difficult. 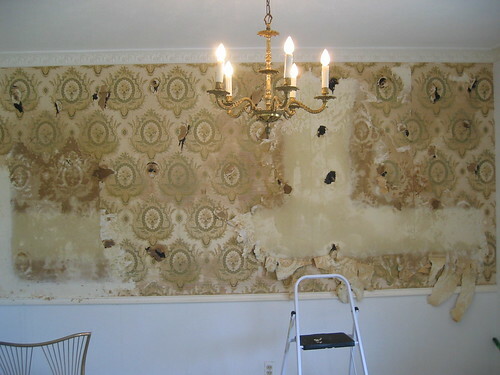 Removing wallpaper, originally uploaded by espeedy123. Went over the entire wall with a scoring tool that cut little slits in the paper so water could seep through to the glue. Sprayed the wall with a 50-50 mixture of vinegar and water. Stinky! Scraped it all off, trying not to gouge the drywall, which was next to impossible in some places, especially under the adhesive. Popped off the chair rail using a mini-crowbar. The nails holding it on should be where there are wall studs. This was a lot easier than I expected. Used a sanding sponge to flatten out the rough edges. Spread joint compound over the wall where the wallpaper was. That left us with a wall that looked pretty good, except that the texture was entirely smooth compared to the rest of the walls in the room, which all had an ever so slight bumpy texture, sort of like the skin of an avocado. Start out with joint compound and add water slowly until the consistency thins out appropriately. Consider using a sand additive to the watered down mixture if the desired finish is bumpy. Apply using a roller with an extra wide nap. So that’s exactly what we did, and it turned out great. Unless you look really, really hard, you can’t tell that this wall was ever different from the others!